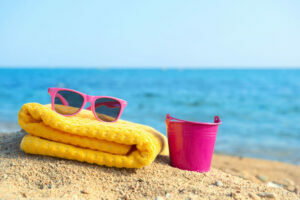 With the summer days rolling in—each one more perfect than the other—it is only normal to feel like you need to spend a bit more time at the beach. 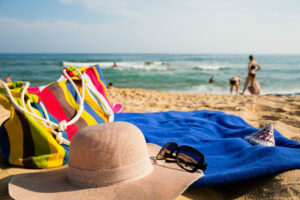 Sure, you are going to need to pack the basics, such as that gargantuan beach towel and a big bottle of sunblock, but do you know what would make your day a lot more enjoyable? Having the best rolling cooler for beach trips, of course! If you come to think of it, investing in a rolling cooler would allow you to enjoy your favorite drinks as you lounge by the seashore. Regardless if it’s drinking a cold beer or fresh fruit juice, or even ice cream, all these are at hand’s length even in the hot summer day if you buy a good-quality rolling cooler. Then again, we know how hard it is to choose from a sea of beach coolers. Thus, allow us to help you out. In here, we take a close look at three of our favorite beach coolers in hopes that you also find the one that suits your needs and preferences. Believe it or not, there are specifics and questions to be asked when it comes to choosing a cooler. There is simply more to the subject than most people would first guess. Different coolers are designed for different purposes, and the best rolling cooler for beach depends on your specific needs. Since they come in many choices, we went ahead and narrowed it down for you with the review of our top three favorite beach coolers. 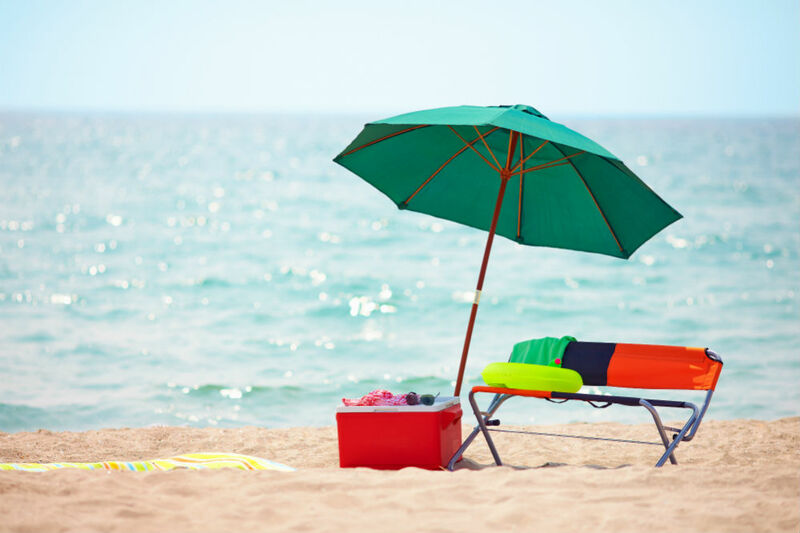 These coolers come in different sizes, so you can be sure that by the end of this read, you will have found the perfect one to bring on your next beach camping trip. The Coleman Xtreme Series Wheeled Cooler comes in color black and boasts impressive internal dimensions of 17.8 by 12.9 by 13.1 inches, which means that it can carry up to 50 quarts worth of food. All in all, this beach cooler weighs just around 14 pounds. The Coleman Xtreme Series Wheeled Cooler is a great option for easy transport of cold food and beverages. Both the design and the capacity are purposed towards sporting events and outdoor activities in general. The cooler is equipped with two recessed, real heavy-duty wheels, which makes transport not only easy but reliable—even if you manage to fill that bad boy to the brim. It works a little bit like an airport suitcase—you extend and then lock the handle, shut the hinged lid closed, and you are ready to wheel with the cooler to whatever location you may be going. A cool thing about this model is the premium insulation coating both the lid and the walls. 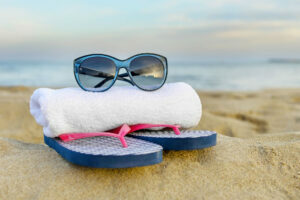 It ensures that whatever items you are keeping will stay cool for a long time. The ice retention time is up to a whopping five days even if the temperature reaches 90 degrees Fahrenheit. Along with its enormous capacity of up to 84 cans, the Coleman Xtreme Series Wheeled Cooler is more than enough for anything. Whether it is a party event with lots of bottles, barbecue that needs the meat secured, or a fancy event that calls for fresh seafood, this cooler has got it covered. An extra bonus, specifically for the beach, is that it comes with two cup holders, making it a safe space for your midday iced coffee or cocktail. And, best of all, when it is the time to wrap it up, you can use the leak-resistant drain to empty the leftover water without having to lift or tilt the cooler. The Travel5.0 Deluxe Rolling Cooler is a simpler, more compact option than the Coleman Xtreme Series Wheeled Cooler. It is measured at 13 by 10.5 by 18 inches and has a weight of 7.6 pounds. It is a foam-padded cooler that has a removable liner, a top compartment for sandwiches and is zippered in the front. For extra convenience, it provides an inside mesh pocket, a pocket cell on the exterior, a bottle holder, and a mesh doc. The locking pull-up handle makes it easy to drag both through sand and road. The rubber roller skate wheels are suitable for almost any of the regular terrains. 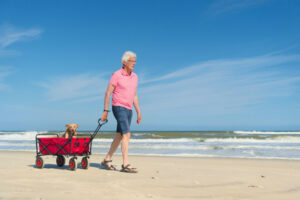 The Travel5.0 Deluxe Rolling Cooler is a great option for couples that are going to the beach for a day, especially if they need to trek in order to reach it. The extra pockets and the design make this choice especially convenient for hiking, trekking, and camping. The Igloo Ice Cube Roller can be seen as a compromise between the previous two roller coolers. Its dimensions are 18.5 by 20.3 by 20.5 inches, and it weighs no more than 12.2 pounds. The design resembles a sort of an ergonomic cube, which is what makes this cooler easier to lift and transport. When placed on the ground you can use the telescopic handle and wheel it around. Of course, the handle has a locking feature for extra comfort. A cool feature of the Igloo Ice Cooler is that it has a total of four cup holders that are molded into the top, making it a perfect option for families and groups alike. However, it is made of hard plastic, so beware. This wheeled cooler is not recommended to be seated on. After looking at all the features, pros, and cons of each cooler, which one do you think stands out? Well, like we said earlier, it all depends on your personal preferences and needs. Any one of these rolling coolers could be your next go-to, beach-buddy! 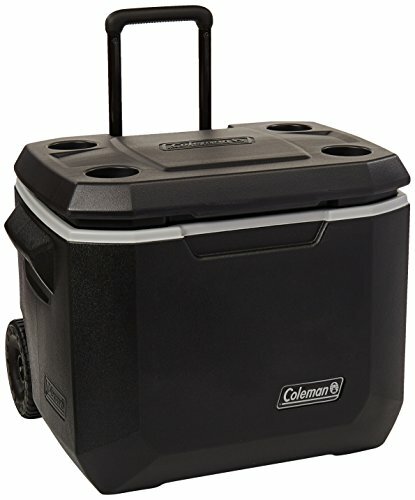 The Coleman Xtreme Series Wheeled Cooler is a heavy-duty cooler with a huge capacity and sturdy frame, making it possible to take on harsh handling and still last. It would be uncomfortable to be taken hiking and trekking for small groups, but is a great option for larger gatherings. It is durable, convenient, and reliable. On the other hand, the Travel5.0 Deluxe Rolling Cooler is a great option for couples or smaller groups of people. Compared to other options, it has less capacity and is made from less sturdy materials. However, this is what makes it easy to move around and what allows it to be taken trekking and hiking. So, if the beach where you are headed to is in a remote location, this might be the option for you! Lastly, we have the Igloo Ice Cube Roller. This one is also a great option for families. Why? 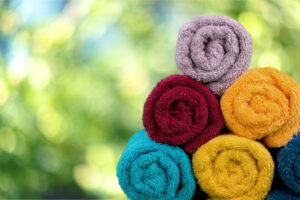 For starters, it is not too expensive, yet you can be sure that it is made of quality materials. While it is not suitable for going on heavy hikes and treks, if you are with children, you are not likely to do so anyway, so that’s okay too. 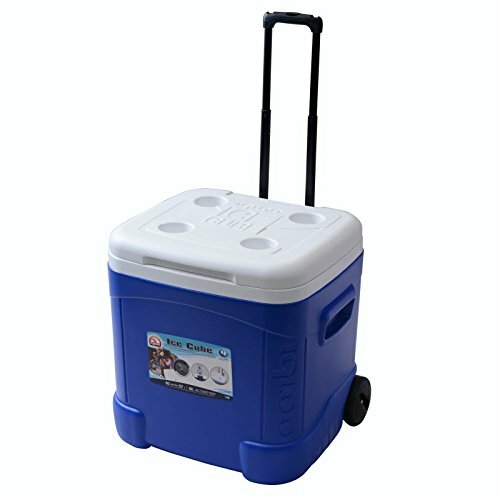 This wheeled cooler has enough capacity to fulfill your daily needs at the beach. For this reason, many see it as the perfect option for those who simply want to relax and enjoy cold beverages on a hot summer day. How about you? Which one would you choose?